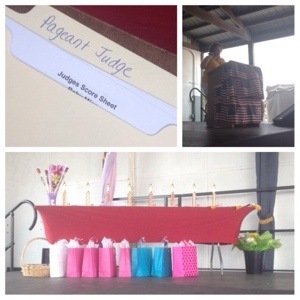 This past weekend I was invited to the annual Miss Saratoga County Fair Pageant to judge girls in 8 age divisions as young as 12 months old, and as old as 21 years. I was very excited when I was contacted; I have never even been to the Saratoga County Fair before. I grew up a hop skip and a jump away, and would attend the Fonda Fair. (I hope to attend the 2014 pageant). As a Judge, I gained free entrance to the Fair! I even got a stylish tote bag for attending on opening day. While there, I caught up with some visiting queens: Amanda Daley, Miss NY American Nation; Abbey Naumowics, Miss Altamont Fair; and Danielle Trumbull, Miss NY International. Titleholders from each division received a cash prize of $100, as well as a gorgeous sash and crown. The high title, Miss Saratoga Fair Queen, went home with $200, the opportunity to represent their region at the Fair and throughout the community during their year, and their photo added to the prestigious Fair Pageant Photo Board. The 2013 titleholders were there to host, and help the young girls if they got frightened on stage. I was pleasantly surprised to see Madison Manuel, Miss Upstate NY, as she gave up her Queen title. She credits her experience as Miss Saratoga Fair Queen as the reason she was able to win Miss Upstate NY. Each girl walked across the stage and modeled her dress. The young girls were asked about their favorite part of the Saratoga Fair. The older girls provided three topics in their application, and a topic was chosen at random. Some of the girls really stood out with their public speaking– they speak better in front of a crowd than I do!